From a young age I loved singing and recording, writing songs, creating new music. I’ve been a working musician but in the end, I channeled that creativity into doing what I love most these days, hair artistry. Growing up in NYC in a culturally diverse community, my family was the traditional Italian family of Queens, NY. We sang together and saw the Mets play as often as we could. Sports were a huge part of the fabric of my upbringing. Here’s where I found my heroes. I watched as these guys became famous and was always impressed by their efforts to help inner-city youth, the homeless and the hungry. I remember from a young age I wanted to be like them, follow their example. Though I wasn’t wealthy, I would find myself dropping all my change in the Red Cross bucket at Christmas, giving as much as I could to the United Way when Bubba Smith asked, and volunteering at youth camps as a counselor or bus driver. As I grew I would bring bagels on the train to give to the homeless as I walked a few blocks to work or school and though many called me a sucker, from time-to-time I’m the guy that gives $5 to the guy who approaches you in the parking lot for gas money. I’ve taken that guy on the street with me into Dunkin’ Donuts and bought him a breakfast sandwich and coffee. At those times I wished I had the means to do more to make a difference. A real difference. Our Vision Statement: Ensure everyone who comes in contact with the salon is elevated emotionally by the experience and looks and feels better about themselves and their lives. We also put a great deal of effort into accomplishing this vision and after five years feel like we are finally making a difference. We accomplish this mission by focusing on exceptional customer service and meting out our philanthropic agenda. As a show salon, we produce four charity events each year and since opening in 2007 we’ve helped raise nearly $250,000 for charities that meet our eligibility requirements. As we receive over 500 requests each year to give, we needed a way to select those that would help us meet our vision statement. Our criteria: Must be recognized by the State of Delaware as a non-profit agency and must guarantee the funds raised are spent only here in Delaware. This level of commitment is hard work. Our stylists become experts in all areas of beauty as they enthusiastically create theatrical catwalks, or fairytale characters or high couture for the shows. Local soloprenuers offer their support by dressing our models or selling their goods at no cost to the charity. 100% of the people involved, give 100% to the charity, at no time does the salon or our participants put any portion of the dollars into their own pockets. In fact, the charity always handles ALL of the money. We were once one of those salons who donated gift certificates and silent auction items, etc. But that wasn’t enough to meet our vision and it certainly isn’t enough to make a real, tangible impact on the needs of that charity. For us going this route we’ve met the children and families whose lives we’ve impacted, we’ve heard their stories of survival and that my friend is what makes it all worthwhile. 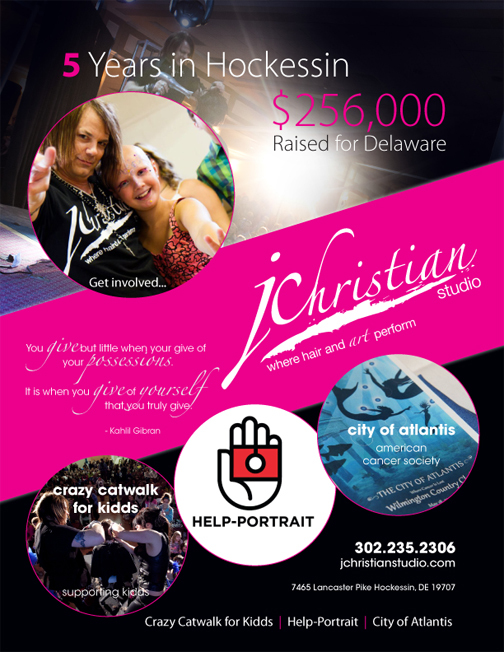 J Christian Studio is an award-winning, upscale salon located in Hockessin, Delaware. We are accredited by the Better Business Bureau of Delaware and recipient of a Torch Award for Market Place Ethics. 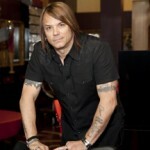 The salon is the concept of J Christian and International Platform Artist and Master Educator and a Member of the New Castle County Chamber of Congress. Next Story → Ming Wang!